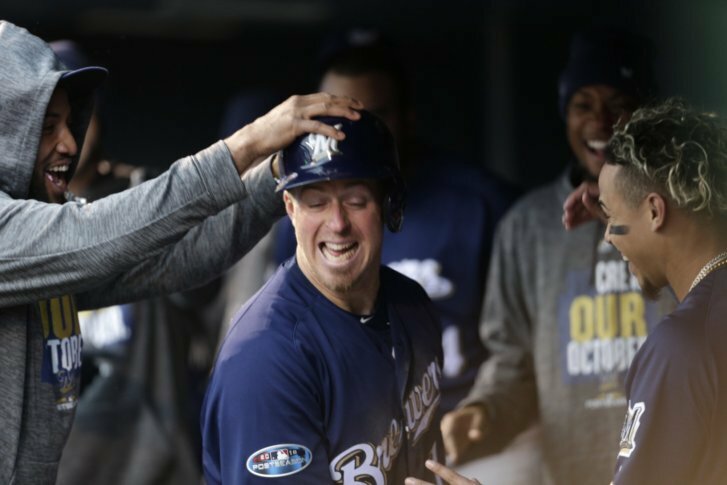 Wade Miley pitched masterfully into the fifth inning before turning it over to a lights-out Milwaukee bullpen, 38-year-old catcher Erik Kratz kept up his torrid hitting and the Brewers beat the Colorado Rockies 6-0 in Game 3 on a cool, misty Sunday to sweep their NL Division Series. So he took off for Josh Hader to give him, “the biggest hug. … Because you celebrate all your celebrations. Because you never know if you’re going to get another one,” Kratz said. Arenado wore a ski mask late in the game due to the cool conditions. … OF Carlos Gonzalez lost the grip on his bat in the ninth and it wound up in the screen by the Rockies dugout. … The Rockies have lost 11 of their last 13 postseason games.